CALGARY – Natural Resources Minister Amarjeet Sohi insists the Trans Mountain pipeline expansion project is “on track” despite reports of rising costs and delayed construction timelines. “We have been able to save this construction season,” Sohi said this week after Houston-based Kinder Morgan Inc. disclosed new information in a U.S. Securities and Exchange Commission filing that showed the project could cost as much as $1.9 billion more than previously thought. “We are very confident this project is on track,” he said. Sohi, who recently took over the Natural Resources portfolio from newly appointed Minister of International Trade Diversification Jim Carr, said there has not been any deviation from the previously announced construction timeline and work is progressing. Kinder Morgan has already started buying and stockpiling pipe for the project, and is now adding staff after the project languished in “suspended mode” for months. Kinder Morgan on Tuesday released financial documents that showed the Trans Mountain expansion, which would boost oil shipments between Alberta and British Columbia by 590,000 barrels per day, would cost $8.4 billion if construction wraps up in December 2020, which is $1 billion more than previously released cost estimates. However, project costs will rise to $9.3 billion if the project is delayed until the end of 2021. Sohi said those cost figures and project timelines were, so far, only hypothetical and prepared as potential cases by Kinder Morgan’s bankers. Ottawa in May agreed to buy the Trans Mountain pipeline and expansion project from Kinder Morgan for $4.5 billion and is preparing to take over once the deal closes. “If you look at the filings of Kinder Morgan in July, the work is proceeding as planned and there has not been any deviation from that,” Sohi said, adding that workforce housing is being built, stockpile sites are being prepared and work continues at the marine terminal in Burnaby, B.C. Given the company had previously announced the expansion project would take 27 months to build and be completed by December 2020, analysts believe the $8.4-billion figure is the project’s most likely final cost. “December 2020 was in line with what they were saying so it makes all the logical sense in the world,” said Dan Tsubouchi, principal and chief market strategist at Calgary-based Stream Asset Financial Management LP. Tsubouchi cautioned, however, that in order to meet that in-service date, “they’ve got to be going full tilt,” and added it is more likely that the project will be completed in early 2021. Kinder Morgan Canada Ltd. president Ian Anderson said at a recent news conference that the company had been “working tremendously hard for the last two months to ready ourselves” to begin construction. Preparatory work on the pipeline route is scheduled to start in Alberta on Aug. 25 and in eastern B.C. on Sept. 3. Anderson said the company is aiming to install pipe in the ground in Alberta in January or February 2019 and shortly after that in eastern B.C. “We don’t have a completion date right now,” he said in late July. Similarly, Sohi emphasized the company and government are still signing contracts for the project and would not change the projected timeline at this point. “As we move forward, we will know more about the closing of the contracts and then we will know with more certainty the construction timelines and costs and we have committed to getting this project done,” he said. If the project’s completion date is December 2020, Kinder Morgan’s financial disclosures show it will spend $1.46 billion on the expansion this year before a massive ramp-up in 2019, when growth capital expenditures are pegged at $3.1 billion. There are still numerous regulatory and logistical challenges before either Kinder Morgan or the federal government can begin construction on the project. Trans Mountain must meet 48 of the National Energy Board’s 157 conditions for approving the project before construction can begin. As of the beginning of August, the company had met 22 of those conditions, but filings for the other 26 conditions were still under review. From an operational perspective, Trans Mountain has also had to staff up after a period that Kinder Morgan Canada president Ian Anderson described at a news conference as “suspended mode,” when the company scaled back work amid concerns about the B.C. government’s opposition to the pipeline. “Progress has been made on signing employment and procurement contracts, preparation activities, receiving materials, seeking permits, meeting conditions, refining engineering designs and notifying neighbours and stakeholders about upcoming construction activities,” a Kinder Morgan Canada spokesperson said in an unsigned email. The company also confirmed it had begun stockpiling pipe for the project and would not be affected by U.S. President Donald Trump’s steel tariffs. 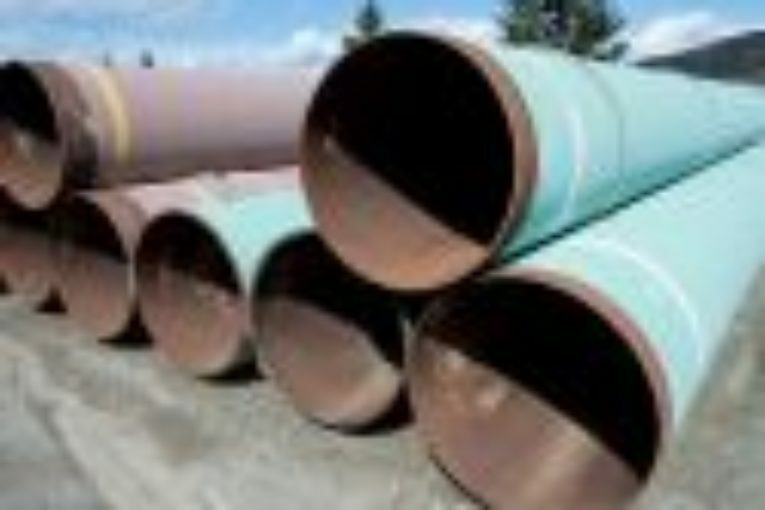 “Trans Mountain has ordered a portion of the pipe needed for the expansion project and pipe shipments have been arriving at our stockpile sites over the past several months, in line with our construction timelines,” the company said. Evraz North America PLC will supply the project with 275,000 tonnes of pipe, which will be fabricated at the company’s operation in Regina. The company began manufacturing the pipe last fall and that will continue through May 2019. Kinder Morgan Canada confirmed the material for the pipeline has been primarily sourced from recycled metal operations in Alberta, Saskatchewan, Manitoba and Ontario, with remaining materials being sourced overseas. “We do not have any plans to purchase pipe from the United States,” the company said, in response to a question about whether U.S. steel tariffs would affect costs. Regardless of when the project is completed, there’s a palpable sense of optimism in the oil patch that new export pipelines will be in service in the coming years to alleviate the existing bottleneck.